According to the restaurant's web site, "Ubuntu" signifies a "humanist philosophy focusing on people's allegiances and relations with each other emphasizing community, sharing and generosity." Owner and founder Sandy Lawrence was introduced to the idea during her time in South Africa, and subsequently opened Ubuntu with that very concept in mind. 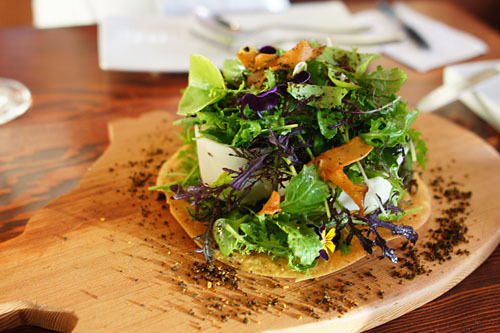 The restaurant focuses on vegetarian, local, seasonal, organic, biodynamically-produced foodstuffs, artfully and skillfully prepared, with the added goals of providing a sustainable workplace and improving the local community. In 2007, Lawrence tapped chef Jeremy Fox (and wife Deanie--they met while working at Rubicon) to open Ubuntu and execute her vision. The restaurant quickly achieved its share of accolades and acclaim, but shockingly, the Foxes announced earlier this year that they were leaving Ubuntu to pursue other ventures. Taking Fox's place is his former right hand man: a 26-year-old Sonoma native named Aaron London. London grew up with dreams of becoming a chef, and formally began his culinary career as a plongeur at a local Mexican eatery. From these humble beginnings, London enrolled in the Culinary Institute of America at Hyde Park, staging at some of Manhattan's top restaurants, including Daniel and Café Boulud, while attending school. In 2002, after finishing his first term at the CIA, he worked an externship at Daniel before relocating to Canada in 2003. Here, London assisted in the opening of the legendary, pork-centric Au Pied de Cochon, then moved to the highly-regarded Restaurant Toque the following year as a Chef de Partie. The Chef then returned to the States, completing his education at the CIA and working at Dan Barber's Blue Hill at Stone Barns. 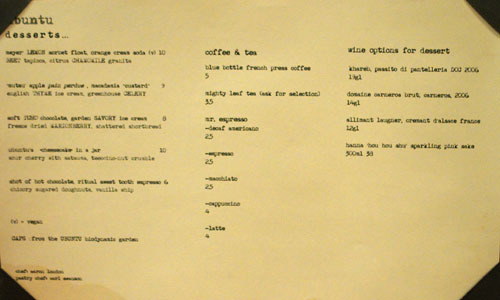 After graduation, London reexamined his priorities and, in 2007, decided to embark on a bicycle tour throughout Europe, staging at various restaurants in the process, including Pascal Barbot's L'Astrance and Alain Passard's L'Arpège in Paris, as well as La Chassagnette in Provence (known for its organic cuisine). While in San Sebastian, Spain, London heard about Ubuntu's opening and immediately flew back to the US, wanting to be a part of the restaurant's opening team. He began on the line, but quickly ascended to a Sous Chef position before being named Executive Sous Chef and then Chef de Cuisine. When Fox decided to leave, London was the natural choice to replace him. The Chef is backed by Executive Sous Chef Stephen Thorlton and Pastry Chef Carl Swanson. Ubuntu is situated in a historic 19th century building in the heart of downtown Napa, renovated and rejuvenated with a "green" philosophy emphasizing recycled and sustainable products. The light, bright, reclaimed wood and stone interior, replete with four life-size stone figures, features a community table for 22, an upstairs semi-private dining area for 35, and a private dining room seating up to 14. 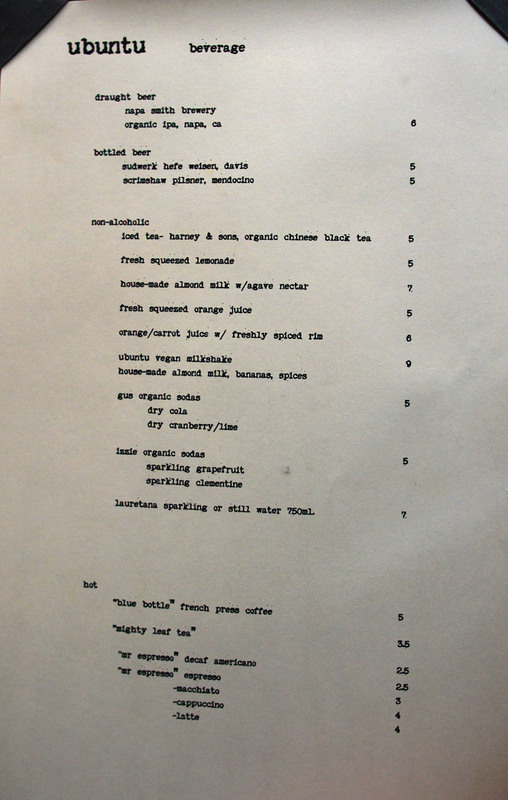 The menu is simple enough, divided into a trio of "snacks" and a decet of courses, accompanied by a focused list of beers and wines. Our server recommended two to three dishes per person, but in true kevinEats fashion, we ignored his warnings and ordered up one of everything, with wine pairings. Click for larger versions. 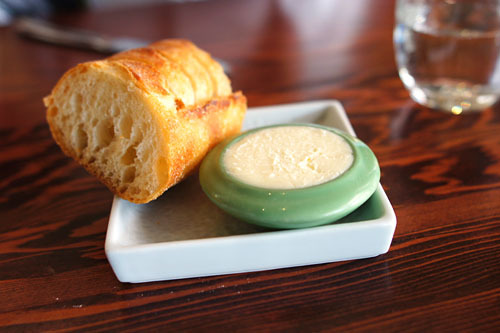 Bread service consisted of a French sourdough from nearby Model Bakery, paired with a light, sweet butter. We began with a duet of beers. 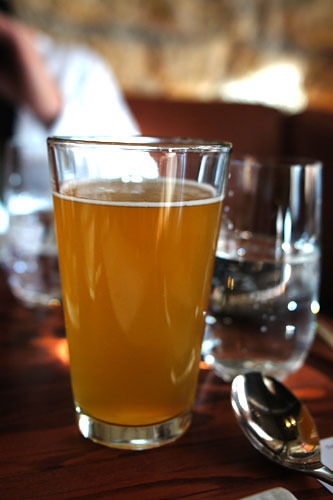 My dining companion chose the Sudwerk Hefe Weisen [$5] from Davis, a fairly prototypical, but tasty hef with expected notes of wheat and citrus. 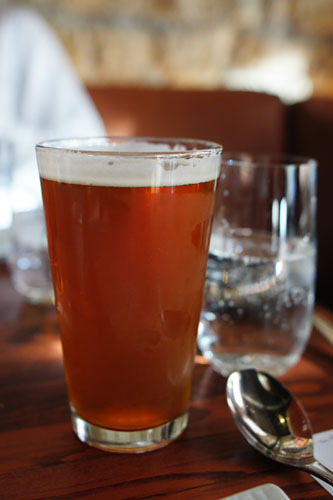 I had the draught Napa Smith Brewery Organic IPA [$6] from Napa, which had a marked tartness and sweetness that set it apart from many IPAs; the signature bitterness, however, was still there, especially on the long, lingering finish. 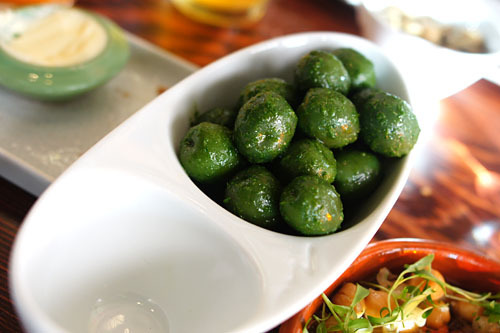 Our first "snack" was a bowl of Castelvetrano olives, a green varietal typically grown in Italy. Relatively mild in olive-y sapor, there were nicely perked up by the piquancy of the pesto. There were far too many olives for two people to share, however, and we ended up taking them to go. Next up was a mound of marconas, a type of almond originally from Spain. 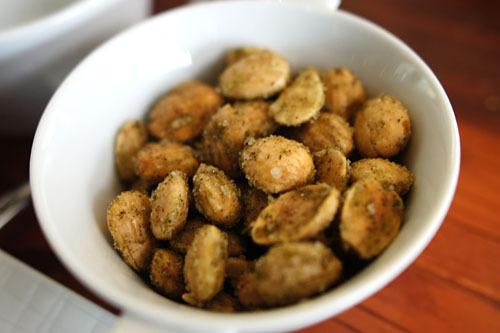 Amazingly simultaneously sweet and savory on the attack, they were a jolt to my palate, but once I got over the initial shock, I appreciate the almonds' delicate flavor and delightfully nutty finish. 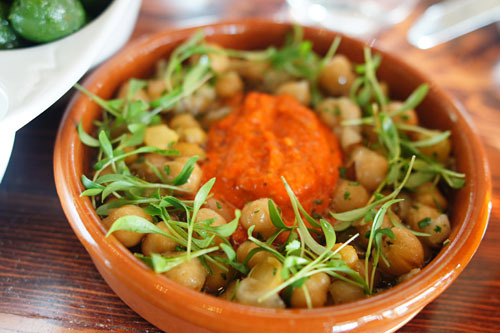 Easily the strongest of the "snacks" was this dish of chickpeas in a Catalan-inspired romesco sauce (red pepper, nuts, garlic, olive oil). The earthy smack of the chickpeas was perfectly balanced by the tart, vegetal tang of the romesco, while the use of cilantro added a further, astringent counterpoint. I absolutely adored this dish, which I'd probably name as my favorite preparation of chickpeas, ever (sorry, channa masala). Light, cool, and refreshing, the subtly vert curry, with its use of lemongrass and coconut, had almost Thai-like tinge to it that I loved. It was fantastic when paired with the included bit of calçot (a type of green onion from Spain) "tempura," which, by itself, tasted somewhat like a Chinese chong you bing! I even ended up sopping up the leftovers with my bread. Very, very good. 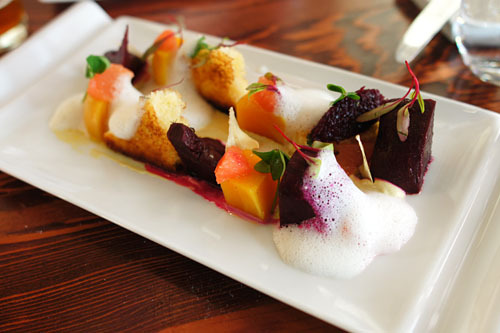 Regular readers will know that I'm often wary of beets, so this was the one course that I was most skeptical about. The beets here weren't bad though, and I even liked the golden variety, which I found sweeter and juicier. Nevertheless, I still appreciated the countering tartness of the goat's milk foam, the eggy weight of the brioche, and the citric temper provided by the pamplemousses (grapefruit). Arguably my favorite item of the night, the so-called carta da musica (a.k.a. 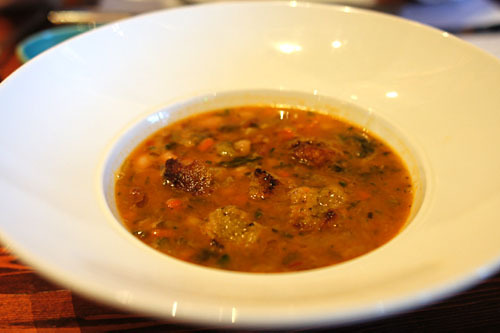 pane carasau) is also Ubuntu's signature dish, the restaurant's version of the classic Sardinian flatbread. I was positively enamored with the fantastic mélange of tastes and textures present here: the bitter, vegetal smack of the greens, the crisp, earthy bread base, the weight of the cheese, and the salty savor of the "orielles" (black trumpet chips). I also appreciated the ironic use of a pig-shaped cutting board as the serving plate. Here we have fennel in multiple forms. The confit was a bit overwhelming for me, but I did appreciate the use of raw fennel frond and its accompanying crisp, focused flavor. The standout here, though, was clearly the savory, pungent "falafel" made from fennel fronds--I wanted to have more of it, wrapped in a pita! Interestingly, my first bite of this was a bold blast of flavor that reminded me of instant ramen spice! Subsequent bites, though, were far less in-my-face. There were two types of carrots at play here. The first, "purple haze," were soft and sweet, too sweet on their own in fact, but the use of the frisee helped temper their sugariness. I much preferred the "white satin" variety. Served raw, they had a crisp, juicy crunch that formed the highlight of this dish. I always look forward to a good poached egg these days, and this did not disappoint. 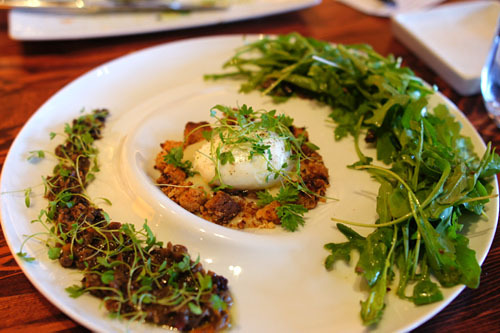 The egg, expectedly luxurious in nature, was offset somewhat by the kohlrabi crumble. 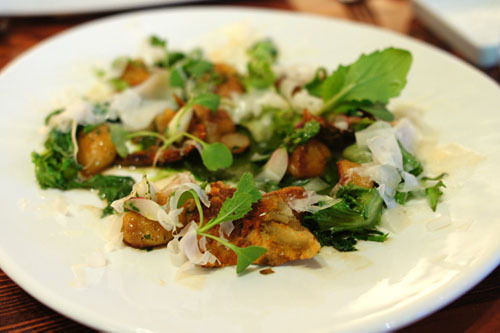 However, the key was the bitter, tangy arugula and how it did a superb job in balancing the dish. I did feel that the kumquat and olive medley was a bit overpowering, however. A hearty, smoky, chili-like concoction, this was another highlight of the meal for me. 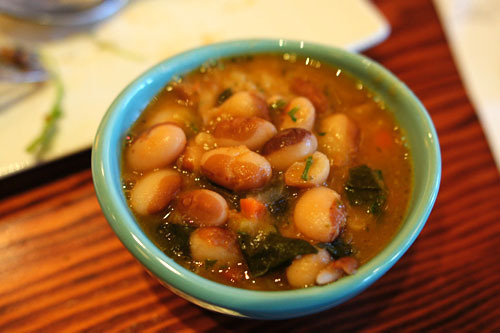 The weighty, dense, earthy beans formed a fabulous base for this dish, while the peppery kale (or cavalo nero) and various spices countered the beans' gravity while giving the soup an almost South Asian tinge. Meanwhile, texturally, things were mixed up by the crunchy rosemary bread. Nice! This was some of the best gnocchi I've had in a while. Taken by themselves, the tiny dumplings were imbued with the subtle essence of their potato maker, but nicely accented by a touch of horseradish as well. The pasta was then further heightened by the substantial weight of the goat's milk cheese, but beautifully offset by the vegetal verve of radish, fava, and turnip. 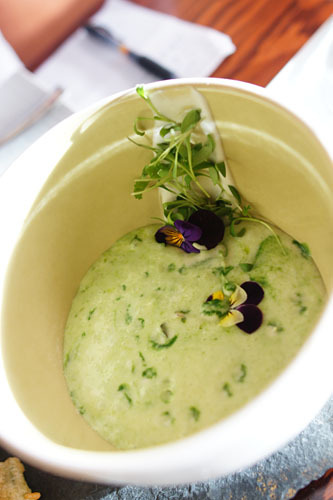 The first time I had grits (at River's End Café in Seal Beach), I was left mildly disgusted. However, over the past few years, I've come to appreciate this humble dish of ground corn, and this was easily some of the best I've had. 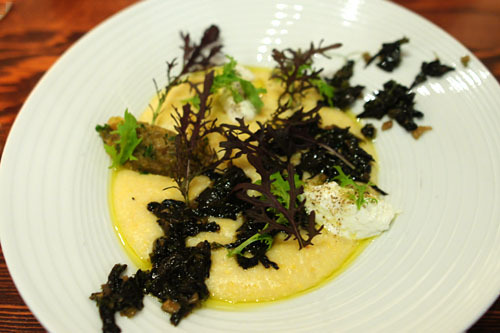 Suitably cheesy, with a light, nicely rough consistency, the grits went perfectly with the mustard-y greens and tangy 'kraut, while the mushrooms added a touch of smoky savor. Our final savory of the night consisted of this lovely plate of potatoes. Mildly salty in savor, the tubers were quite delicious on their own, albeit a bit heavy. This problem was solved by the tartish "mayo" and the medley of vegetables at play: nettles, miner's lettuce, mustard, and sorrel. 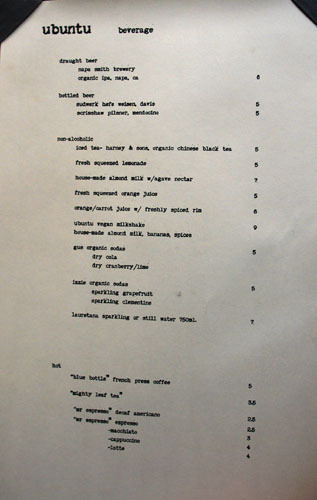 Above is the dessert menu, which comes courtesy of Pastry Chef Carl Swanson. 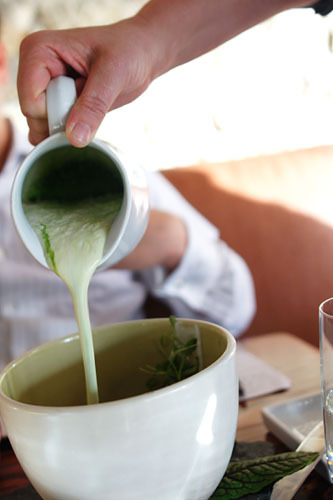 Swanson has served a remarkable career at a number of leading Bay Area restaurants. 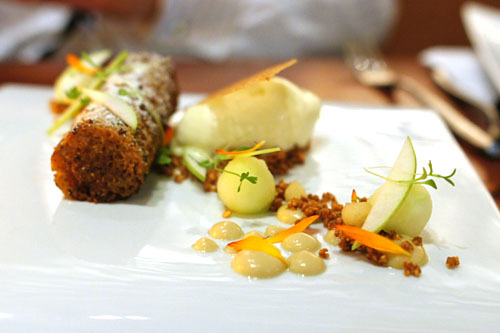 He began on the savory side at Manresa, but eventually made the transition to pastry. From here, he moved north, landing at Cyrus before relocating to Napa to open Ubuntu under former Pastry Chef Deanie Fox (née Hickox), his mentor at Manresa. 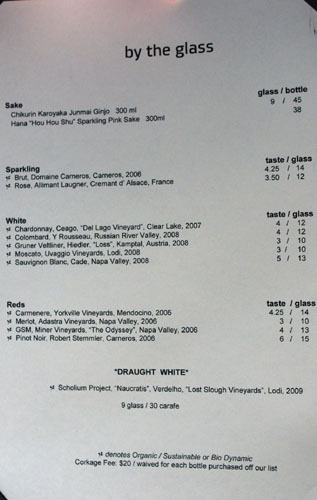 Afterwards, the Chef worked at Meadowood (which I'd just visited the day before this meal) before returning to Ubuntu in late 2009. 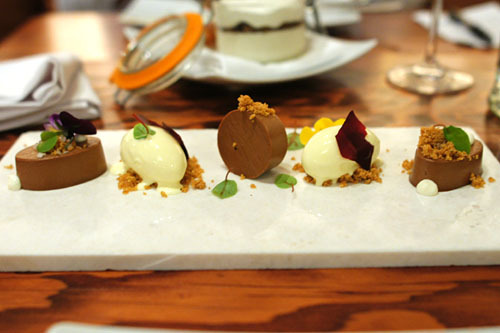 With the departure of both Foxes in February 2010, Swanson rightfully assumed the position of Pastry Chef. Click for a larger version. My first taste of this was bracingly cold, numbing, in fact. Once I got past that, I appreciated the light, refreshing sourness of the citrus, accented by a slightly minty tinge, as well as the gravity and textural play imparted by the tapioca. My dining companion's favorite dessert. I remember the first time that I had pain perdu. 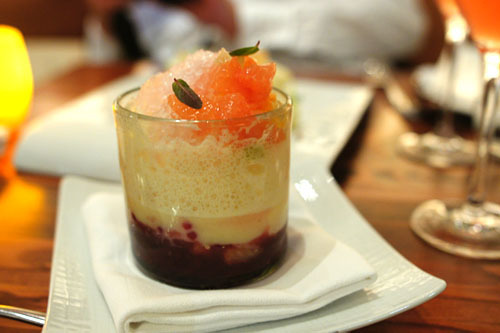 It was at a place called Bistango in Irvine, CA, and I recall not being too fond of the dessert. Since that time, I've begun to appreciate this "lost bread," and this was a prime example. The cake was suitably rich, moist, and eggy, but fortunately, not too sugary. I liked the use of apple, which gave the cake a nice crunch, while the thyme ice cream and celery contributed a vegetal counterpoint. TCHO, an artisanal chocolate maker based out of San Francisco, is perhaps best known for its chocolate flavor wheel. The product here was quite finespun in flavor, augmented by the marionberry (a type of blackberry) and shortbread crumbles. I rather liked it, especially when paired with the slightly savory ice cream, which resulted in a lingering saltiness on the finish. 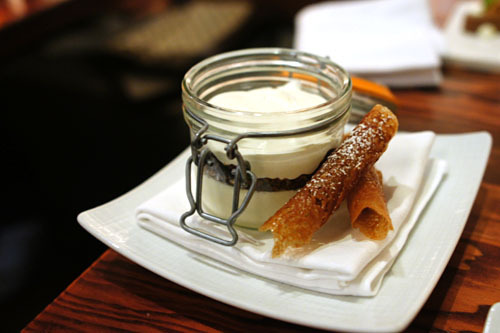 Here we have Ubuntu's signature "cheesecake" in a jar. It had a creamy, light, delicately saccharine flavor that I adored. The crux, though, was the dark, overt sweetness of the cherry and satsuma, which lent a wonderful complement to the "cake." My favorite dessert of the bunch, easily. The doughnuts themselves almost had a churro-like character to them, and were great to dip in the bitter, strangely savory hot chocolate. 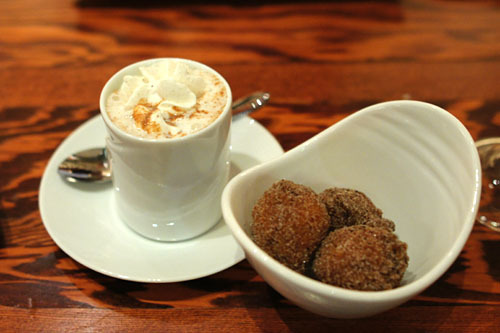 Think of this as Ubuntu's version of The French Laundry's famous "Coffee and Doughnuts." I came into Ubuntu with some trepidation, but I'm happy to report that the restaurant exceeded my expectations. 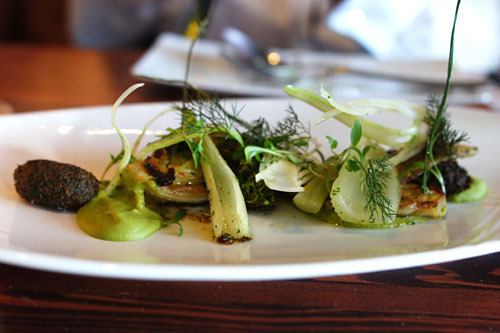 The food here is bright, bold, with dash, and verve; it's vivid, vivacious, artistically plated--beautiful. 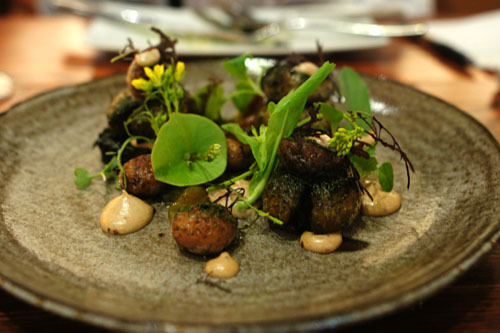 The kitchen's really pushing the boundaries of what's possible in vegetable-centric cuisine, and guess what--I didn't miss the meat at all. This is no omnivore's dilemma--Ubuntu's got the goods. 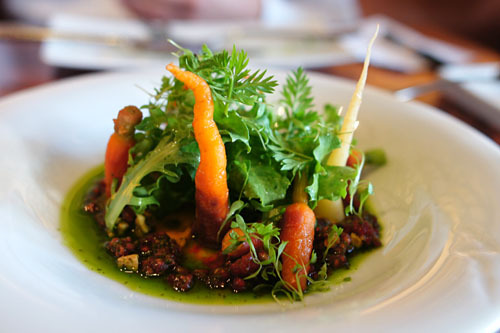 The plating was gorgeous and everything looks so delicious for being vegetarian. in fact, I had to go back and reread your intro to make sure that everything was vegetarian--I couldn't believe it. I don't think I would've missed the meat either! The calcot and curry is simply amazing. Very innovative. Thanks for the review! Another hidden treasure in Napa. Will definitely look into Ubuntu next week when I go. 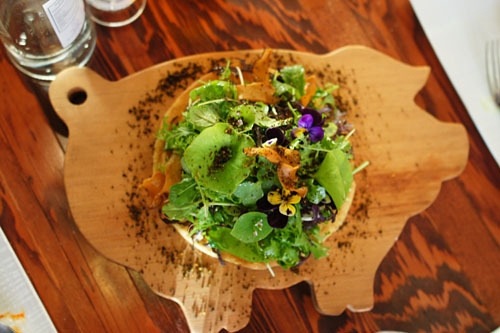 Looks like a very interesting place, love the plating (and I want that piggy cutting board). I know Ubuntu's a S African word and all but the first thing that comes to mind is still the operating system ..
ubuntu was awesome when i went - glad to see that food still holds up with new chef at the helm. here's another tip -- if Ad Hoc is serving Lamb this week - go back there...it was even better than the fried chicken and i have had both there. Funnily enough, those pictures made me just a bit homesick. Looks like another fantastic meal. I only went when Chef Fox was there, but I loved every visit. You're right. You never miss meat for a second. It's odd, you know my preference for vegetables/salads/fruit over meat or fish. I couldn't wait to go to Ubuntu. 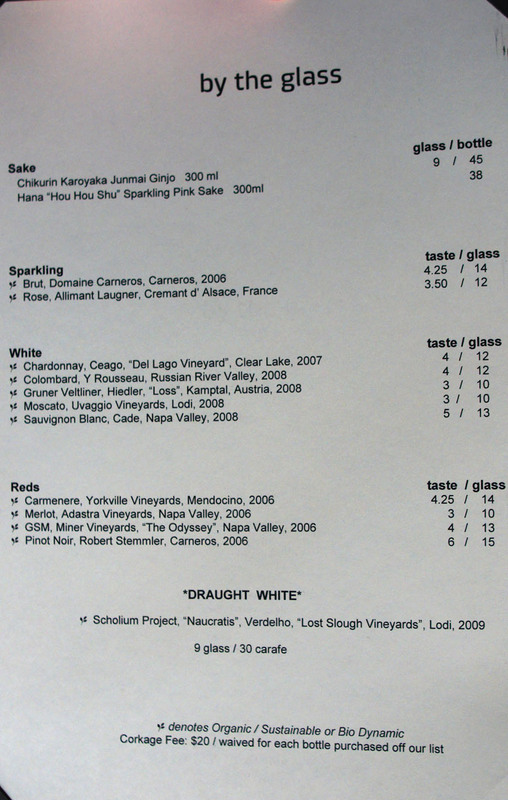 And I was very disappointed by my meal there, feeling other places like Dry Creek Kitchen in Healdsburg or Domaine Chandon in Napa near Yountville had far better vegetarian choices and desserts. Weird too, unlike Radman, I thought Madrona Manor was mediocre, and far from deserving a Michelin Star on Christmas. Oh well, we each have our own personal tastes! I know its Napa but I am guessing its in a posh neighborhood? Couldn't help but notice the Z8 driving in front of the restaurant. Christina: Some of the dishes had egg, so I'm not sure the food counts as strictly vegetarian...but really that doesn't detract from the quality of the meal. Jai: Looks like someone has a man crush on Jeremy Fox. ;) I just went back and took a look at the pics of the food on Yelp. London's plating may be a touch more conventional, but I do expect him to get even better with time. Cookie: Definitely give Ubuntu a shot. Where else do you like up in Napa? radman: I'm already back in SoCal, so unfortunately Ad Hoc is a nonstarter. Interestingly though, we were actually thinking of heading over there had we not been full from Ubuntu! 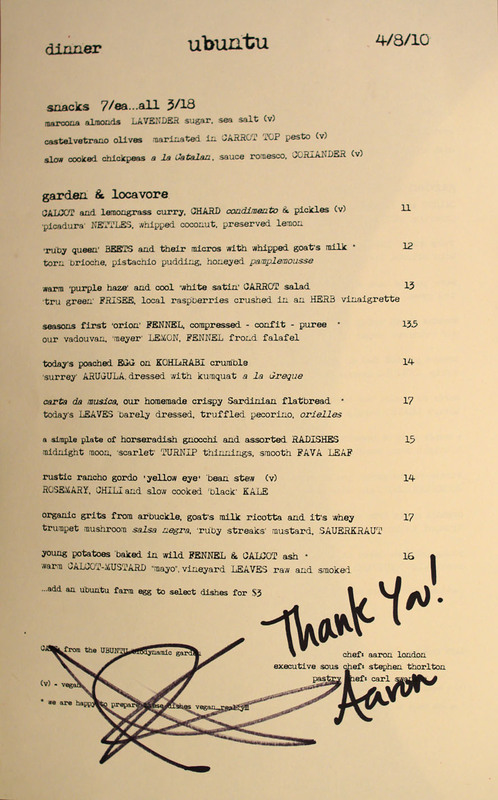 Andrew: Since you've dined multiple times at Ubuntu under Fox's tenure, how do you think London's holding up? Aurora: I've actually been to Cyrus, but looking back, it was a touch underwhelming. I'm normally a fish/meat kind of guy, while you're into more of the veggies--we're coming in from different perspectives. Perhaps that's why we don't agree on Ubuntu. Oh well, whatever floats your boat I suppose! Tsz: And what did you have for breakfast?!? Agree about the curry--it's funny how things that I eat now remind of the old Chinese food I had when growing up! The food looks largely the same as Fox-era Ubuntu - maybe not quite as refined - but i'm sure the chef is still working out his thesis. 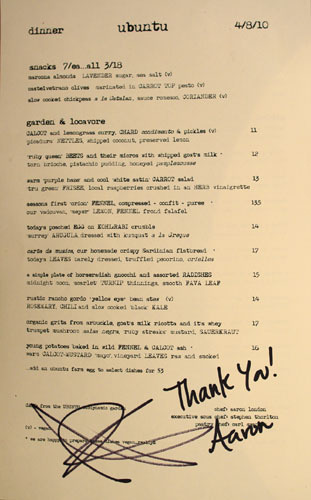 Ever since Chef Fox left, it seems like the menu comprises more of like a "best of" compilation of the most well known dishes in his past repertoire. I dont really see any of the occasionally more cutting edge dishes (i.e. 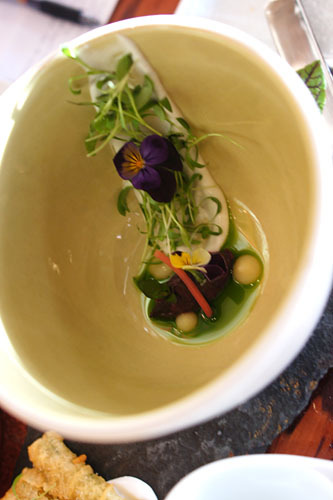 the pea pod dish seen on Food Snob) which provided some more interesting direction into the original chef's visionary creativity. Chuck: Your review was one of the first that got me excited about Ubuntu. You should definitely return to check on Chef London's progress. Anon: Interesting observation. Do you think that Chef London's still settling in? That once he gets more comfortable, he'll branch out a bit? Great report Chuck! I look forward to reading about your thoughts on Ubuntu once you give it a go under Chef London. can't wait to see what Fox will bring when he does his weeklong Animal stint next month! And RE: vegetarianism concern (thing I picked up from my monthlong, and maybe longer, stint) eggs are OK for vegetarians unless they specify lacto-vegetarianism. A bit more on the gray line are the cheeses, since the rennet (enzymes to curdle & separate the milk) is traditionally derived from calves' stomachs. There are now plant-derived rennets too, but many cheesemakers (particularly the older creameries) for various reasons --keeping with tradition, preserving a certain quality--would still use animal rennet. And restaurants may not be able to tell you that info off the bat either, so thus far I've avoided Old World cheeses (since those tend come from creameries with more history and thus inclined to stick with traditional methods) and ask & do my homework when I can. I've already got my reservation for Fox's stint at Animal--excited! Which day are you going? Thanks for providing more insight into vegetarianism. I would've thought that eggs were easily "worse" than cheese, as an egg potentially could develop into a full blown animal. Well, the overwhelming majority of eggs laid are unfertilized (barring more exotic fare like balut) so the chances of an egg developing into an animal is minimal. And on the basis of ethics, there's some gray area too as to whether dairy or eggs do less harm; ovo-vegetarians (no dairy, but eggs OK) would argue that chickens would be laying eggs regardless naturally, whereas cows (and other mammals) are forced to give birth more often than they should in order to stimulate milk production. Hmm...thanks for the the bit of clarification on the issue. So are you doing a Meatless May after all? Kevin--I've got one night in Napa coming up. IYHO, should I go to Ubunto, Meadowood, or La Toque. Can't get reserv for FL or Cyrus. Many thanks. I'm going to say Ubuntu David. was it just you and one other person? how did u guys manage to eat all that food? my friend and i each ordered chef's tasting and the orders of olives and almonds and we were DYING to finish at the end. it was surprisingly/intensely filling for a vegetarian meal. in fact the party next to ours were all hunched over because they couldn't sit up straight due to how filling their meal was. anyways it was one of the most pleasant dining experiences i've had. i already want to go back. Yep it was just me and a friend. We have big appetites. ;) But yes, we were also quite sated at the end.